WHEN you walk 24 miles (39km) in one day the soles of your feet sting and your socks feel like Brillo pads. Your legs don’t bend easily at the knees, your body aches all over, and your skin feels tight beneath a microscopic shell of sweat, dust and grime. You crave food and beer, but you also crave sleep. The desire for a hot shower passes long before the 20-mile mark. Food and beer are all that matter – and sleep . . . The Three Peaks is a walk many outdoor people undertake at some point in their lives. 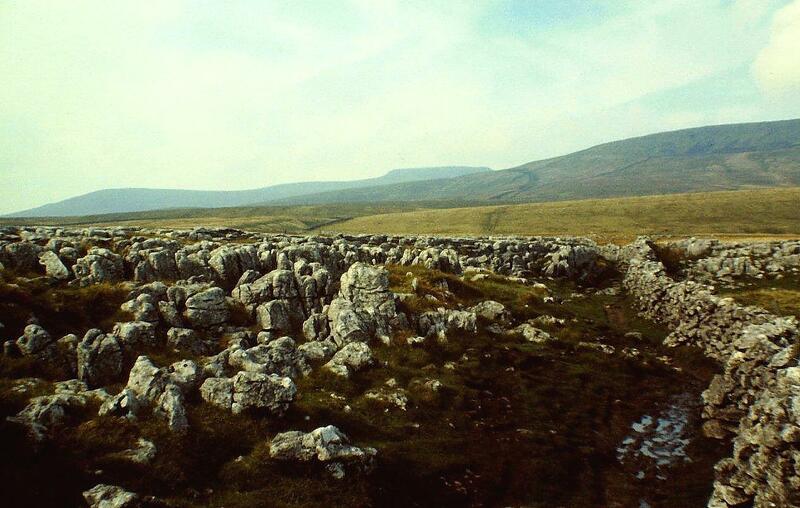 Traditionally, the Pennine peaks of Pen-y-Ghent, Whernside and Ingleborough are tackled in an anti-clockwise direction. For some reason lost in the clefts of memory I set out from the campsite in Horton-in-Ribblesdale, climb Pen-y-Ghent (694m), then double back to the village and proceed in a clockwise direction. 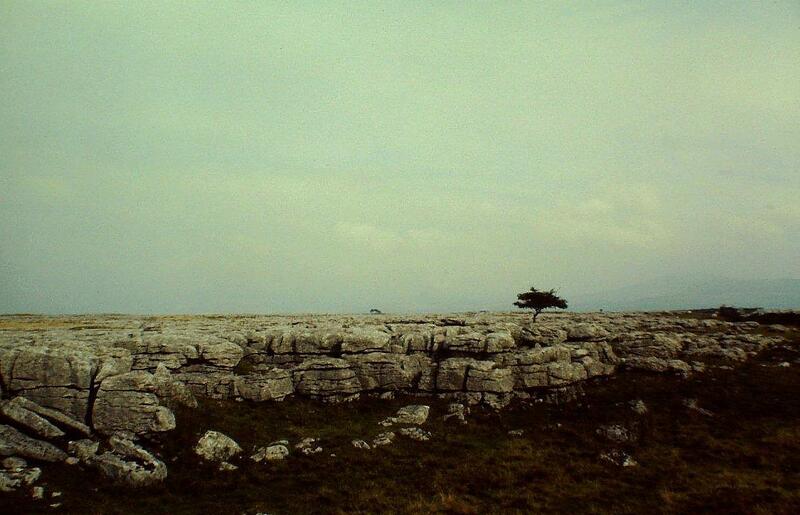 Ingleborough comes and goes in a flash of limestone clints and wide horizons. It’s extremely cold and windy on the summit (724m), a hint of autumn in the air. Not a place to hang about on a dull day wearing little more than a thin shirt from Asda. We’ve a new prime minister, by the way. A bloody Tory woman. Don’t reckon much of her chances. Joe Gormley will sort her out. Wait and see. On neighbouring Whernside (736m), I experience unassisted flight for the first time. A terrific and constant wind roars up Wherside’s steep south-east flank from Ribblehead. I take the direct route to the valley in great bounds, the wind lifting me into the air and holding me suspended for seconds at a time. Good job I’m not wearing my windproof jacket because I’d probably end up on the Isle of Man. Mind you, that would save me waiting for my mate Harry to take me there on his boat. I’ve been waiting five years already. The exhilaration of unassisted flight is short-lived. 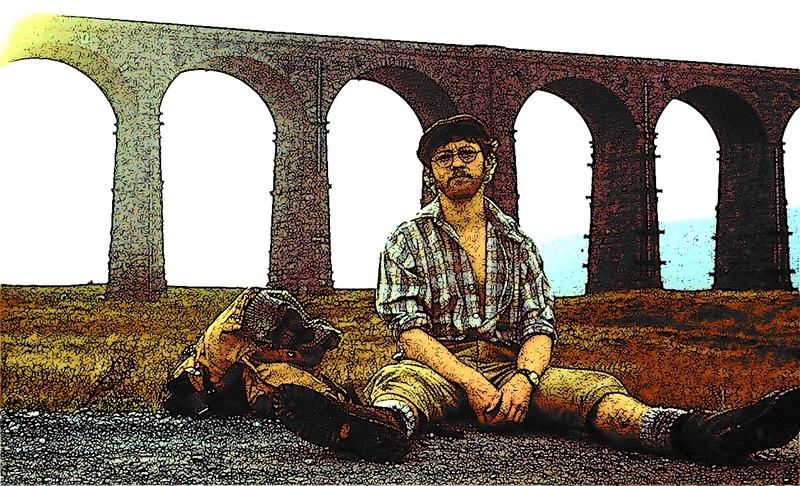 Beneath the spectacular Ribblehead viaduct I collapse and devour my last few crumbs of food. My legs feel like lumps of railway sleeper, knees like rusty points. Every solitary step hurts the soles of my feet. When I rest they throb painfully in my boots. Is this fun? No, but it will be great when it stops. I limp into Horton in the late afternoon and crash down in my tent. When I lie still the pain stops. Ah, the joys of walking. I can’t remember anything else. How did Joe Gormley get on? Beneath the viaduct. Only another six miles to go . . . This entry was posted in Camping, Climbing, Environment, Footpaths, Hiking, Mountains, Pennine Way, Walking, Weather and tagged outdoors, Pennines. Bookmark the permalink. He was right. But he was, to use his own words, “as fit as a bull moose”. After that walk I was about as fit as a lame mole. At least THE 3 Peaks is well set up nowadays for food and drink. We did a similar route but the other way around but doing Penyghent separately last. That gave me chance to change my socks at the car first – a great healer for hot feet! After walking up the road to Ribblehead we stopped for breakfast at the butty wagon, after doing Whernside next, we stopped at a farm which now does cold drinks and ice lollies (it was a very hot day). After Ingleborough we stopped for more ice lollies and cold drinks in Horton. That definitely sums up how you feel by about half-way round on a hot day! 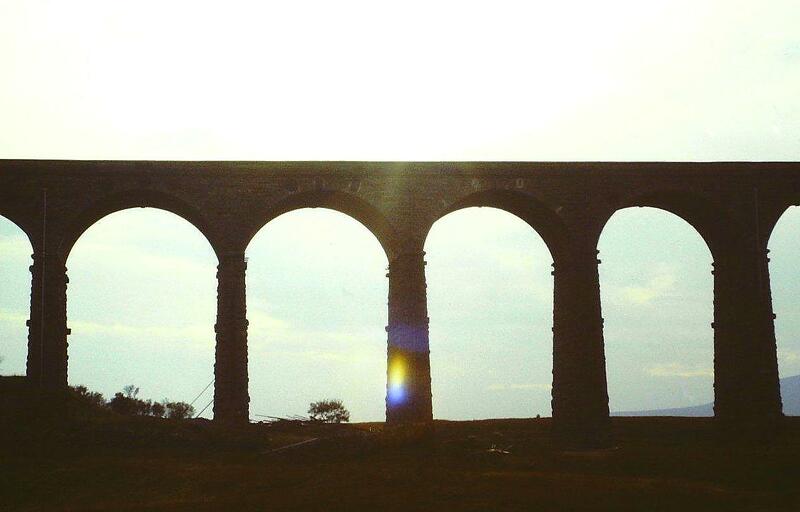 I love that photo of you slumped down below the Ribblehead viaduct looking tired and fed up – didn’t you call in the pub for one before you continued to Horton? Blimey, Carol, that’s a gastronomic tour of North Yorkshire with some hills thrown in. There was nothing like that when I did the walk. And as for the pub near the viaduct (is it the Railway Inn or the Station Inn? ), this was back in the days when pubs had to shut at 3pm on a Saturday afternoon and open again at night. So it was bloomin shut. I remember having a few pints in Horton and getting into an argument with a bloke in the bar, but that might have been the night before. Happy days. Thanks, Leamuse. They were taken on Kodachrome 35mm transparencies and converted to digital. The originals have more definition, but what the hell. Funny to be ‘suspended’ if you land neatly. When I think of you flying away to the Isle of Man it reminds me of Harry Potter. Glad you didn’t wear your windproof jacket. You are patient with your friend Harry. Hope he reads this very humorous post. We have some guidebooks in Denmark called The tour goes to …. One of the last books from the publisher is called The tour goes to Hell. The book gives examples of when everything goes wrong on a trip. You get an upset stomach and currency stolen. The hotel room stinks. The weather is too hot and the bugs are too large. Hi Hanna. Yes, I am patient with my friend Harry. But he has a lot to put up with, keeping his wife in luxury and attending to her every need. I have no doubt that one day we will sail away to the Isle of Man together and talk about old times while the sun sinks below the horizon. I look forward to that. I like that guidebook thing. Things go wrong all the time. That’s given me an idea for writing something. Hi Jo. 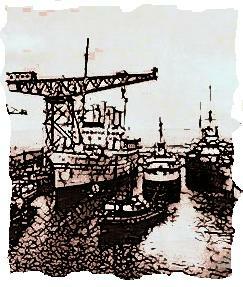 It’s a very inexpensive way to travel but there are occasions when you come down with a bump. I have experienced similar winds in the Howgill Fells, near Sedburgh, and it’s great fun once you get the hang of it. I also got “blown up” Mam Sodhail above Glen Affric once, and that’s a great way to climb mountains. Takes all the strain out of it. Tynemouth Tirpitz again! 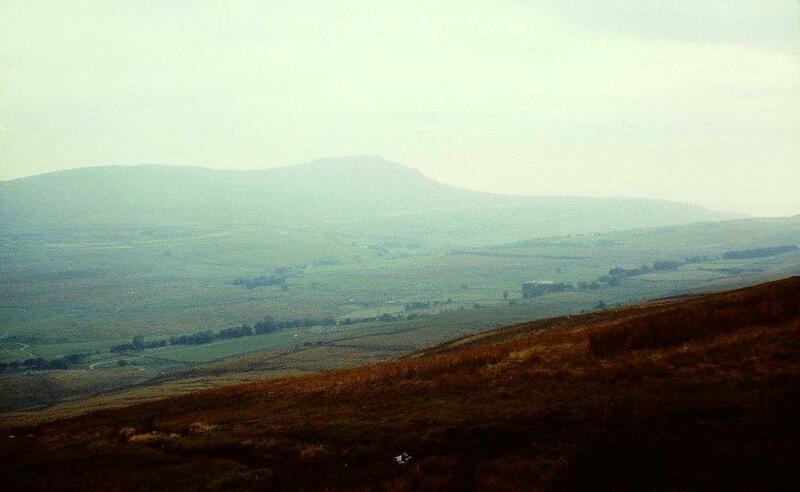 I climbed Pen-y-Ghent many years ago when it was Penyghent (as the mountain coward writes) all I remember is the raisin sandwiches we ate on the top and nowt else! I was born at an early age and it is now Pen-y-Ghent? Are the Welsh re-naming it? I think we should be told. Perhaps Nothern Echo workers toiling in The Valleys might have renamed in the hope of an increase in pay. How ever I have found out (This is true)that a former pupil at my old alma mater helped to remove President Lincoln’s body out of the theatre when he was shot.Was he the person who went back in and said ‘Apart from that Mrs Lincoln did you enjoy the show’? So back to investigation.I quitted hill climbing when the annual Admiral culling season started.More later. I am very impressed with the President Lincoln story, Peter, and wish I had one to rival it. My father did once shake hands with Sir Alec Douglas Home at a garden party at Holker Hall but he was still alive (in fact, they both were), so I suppose it doesn’t count. Hi James. That sounds like a good time. I’m only two years behind you in the age stakes so perhaps I might do it again. Or perhaps not. I think my legs would seize up these days. Ha ha. I remember the Hill Inn from my caving days. Ah, happy times . . .